We specialize in pets with special medical or mobility needs including senior pets, post-surgical mid-day checks, and pet taxi service to follow-up appointments. We’ll care for your healthy pets too! We take care of dogs, cats, most small animals, and your non-business “urban farm”. Oh My Dog! (Sitters) LLC’s primary service areas are 98501, 98503, 98506, 98516 and parts of 98502 and 98513 for standard pet sitting services. 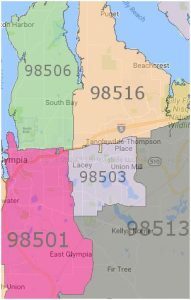 We also serve the Black Lake/Cooper Point area of the west side of Olympia (98502) about as far north as Harrison Blvd. We may serve outside this area though additional mileage charges may apply. If you’re unsure whether or not you’re within our service area email us at ohmydogsitters@gmail.com, we’d be glad to answer your questions! We’ll take care of dogs, cats, fish, birds, small mammals, rabbits, chickens, ducks, goats, sheep, horses, etc. If your pet requires milking or eats live food (sorry snakes & cricket eaters), we’re not your best choice. Our insurance does not allow us to be responsible for your income-producing animals or bring your pets to our homes. We also must leash dogs in a yard without a physical fence. Meet & Greet for scheduled sit is free. Meet & Greet for “just in case” is $15, which will be credited toward your first service when it occurs (within one calendar year). If you need someone prepared to come for an unplanned visit if you’re away and unexpectedly unable to return on time, if you have pet that may need a pet taxi on short notice etc. At the scheduled Meet & Greet, please be prepared with Client & Pet information (see Client Forms), TWO sets of needed keys and payment deposit. Standard visit: $25 A Standard visit is an approximately 20-30 minute visit. Long visit: $40-$50 A long visit is approximately 45-60 minutes. If you have multiple pets needing care, if additional cleanup or care is needed or extra time for both playtime and feeding would be best for your pet, you would want to schedule a long visit. Visits approximately 45 minutes are $40 and approximately 60 minutes are $50. Short visit: $18 A short visit would be less common, but if you have small pets (hamster, fish, rabbits etc) that don’t enjoy much attention or a cat that shuns anyone from outside the home, you may qualify for a short visit if their needs can be met in 15 minutes or less. Pet Taxi: $30 for drop off service (one-way service) plus $.50 per mile from requested origin to destination. Round trip service $50 per hour plus $.50 per mile. Lockout service: Available to current clients 9 am-9 pm, $15. This is a courtesy service we offer but we do not guarantee someone will be available at any given time, so also keep a locksmith’s information handy. Oh My Dog! (Sitters) LLC is licensed in Lacey, Olympia, Tumwater, Thurston County Washington. We’re insured through PSA, including coverage for client’s property (similar to bonding). Oh My Dog! 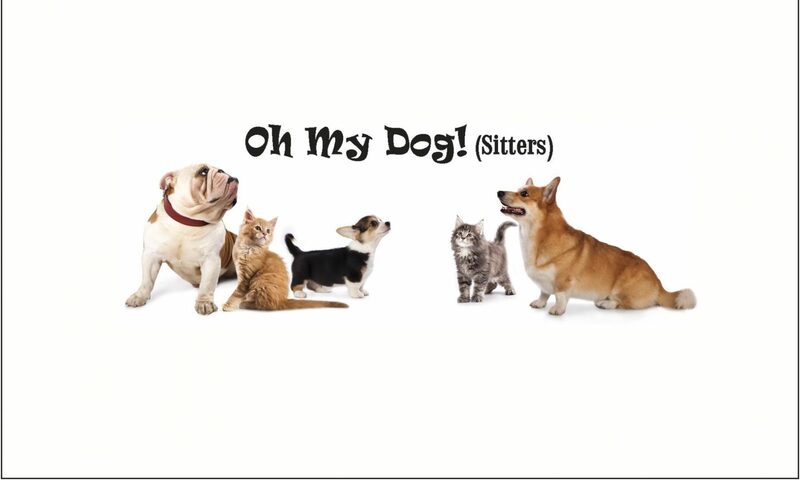 (Sitters) LLC is a member of PUPS (Professional United Pet Sitters) and PSA (Pet Sitter Associates, LLC). I’ve had pets my whole life. Growing up we had several dogs, cats, rabbits & ducks, and even lambs for a time. My grandparents even had a pair of pet skunks and a woodchuck at one point! I loved horseback riding at the local stable and visiting the calves at the dairy farm. As an adult, being a military family (now retired) we were more limited, but our dogs and cats have always been a part of our family. I have experience with the young and old ones, the well and not-so-well. 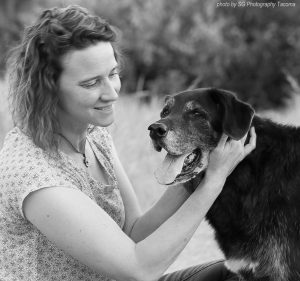 In our house, we’ve dealt with allergies, auto-immune disorders, Addison’s disease, arthritis, hip dysplasia, cancer(s), kidney disease, UTIs, surgeries, physical therapy, alternative therapies, the list goes on. I understand the level of care and gentle handling they require. Dana accepted a great opportunity to be a part-owner of Four Paws Animal Rehabilitation in Olympia, so while we still love her, she doesn’t do much sitting these days. I know you’ve heard it before… it all started in my childhood. When it comes to living with dogs, for me it did. Dogs often outnumbered people in my house at any given time and I loved it. Our house was full and they were my best friends. Growing up my parents showed Salukis, my dad hunted with Brittanys, we lure coursed on the weekends, we groomed, exercised and played. It was great. 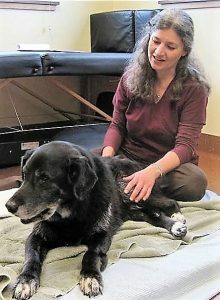 I am a Canine Massage Therapist certified in Maintenance, Performance, and Rehabilitative Massage. I know how important your pet is to you and welcome the opportunity to care for them when you are away. Additional Sitter profiles coming soon!